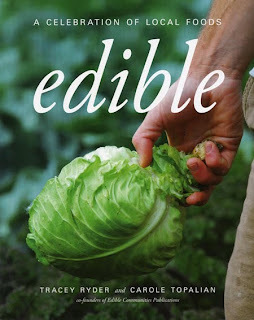 When Edible: A Celebration of Local Foods arrived in the mail for review, the first thing I did was look at the photos. And gorgeous photos they are; this is a coffee table book. Edible has 80 recipes, but it's much more than a cookbook. If you like knowing "the story" behind what you eat nearly as much as you like eating, you'll enjoy Edible. With inspiring stories about some of the people at the forefront of the local foods movement from coast to coast, it gives readers in any circumstances ideas they can incorporate into their lives. There's the story about Allandale Farm. (I have great respect for farmers and, in this era of celebrity chefs, I wonder why we don't have celebrity farmers. But don't get me started on the whole sad "celebrity" thing!) Allandale Farm is in Boston! Just seven miles from downtown Boston, it is one of the oldest privately held family farms in the country. There are stories about country farms and city farms, school programs and community programs, fishermen and farmers, butchers and bakers, chefs and all sorts of people involved in bringing the food to our tables. I love reading about what's cooking in different regions. The recipes are arranged by season and indexed by region. There are lots of delicious vegetable dishes I'll be experimenting with as soon as the ingredients are in season. Double Corn Spoon Bread, Mushroom Soup au Gratin, Vermont Cheddar Ale Soup, Wild Onion and Spinach Tart, Egg Noodles with Fresh Spring Vegetables look like terrific choices for us "comfort food" types.Yesterday I tried a recipe from the summer section--Frozen Maple Mousse. It said, "This is a great ice cream-like dessert that doesn't require the use of an ice cream maker." Well, that's good for me because I don't have an ice cream maker. I divided the mousse among six 3/4-cup ramekins. Probably could have made seven, but then I wouldn't have had quite so generous a "cook's treat" to enjoy unfrozen. 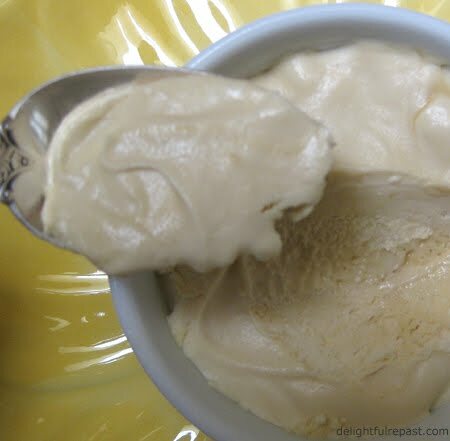 I made it as written--had to restrain myself from adding a pinch of salt and a little vanilla--and was amazed at what three simple ingredients had turned into! I'll probably make it with just 3/4 cup of maple syrup next time, but that's just me--I like desserts a lot less sweet than most people prefer. And, rather than garnishing with toasted slivered almonds, I might just stir in some toasted chopped walnuts or pecans before freezing. Grade B maple syrup; “B” just means darker, not inferior. but not boiling, 4 to 5 minutes. Remove the bowl of maple syrup from the heat. curdle). Whisk the egg yolk mixture into the bowl of maple syrup. onto the surface of the maple syrup mixture to prevent a skin from forming. Refrigerate until completely cooled, at least 1 hour. Using a hand mixer or stand mixer, whip the cream until stiff peaks form. maple syrup mixture. Repeat until all the whipped cream has been folded in. serving dish. Cover with plastic wrap and place in the freezer for 6 to 8 hours. To serve, garnish with toasted almonds, if using. Recipe reprinted with permission from Edible: A Celebration of Local Foods by Tracey Ryder and Carole Topalian (Wiley). "Celebrity farmers" -- a winning concept. And a winning recipe to cap a winning review. Thank you, Sully! What you would love about these stories of farmers and food artisans is their passion, their daily passion, for what they do and where they are on the planet. Hi Jean, Have you heard of Outstanding in the Field? 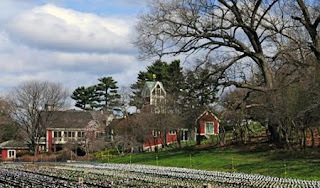 They showcase local farms and local chefs and you eat in a gorgeous setting at the farm. I'd love to go someday, just too pricey for me right now. Jean, I love the idea of celebrity farmers! Maybe it will catch on. The book looks awesome! Hi Jean! I got your message thank you and I have changed my comment setting. Just have a second to drop by and say hello but I will return again soon. By the way I LOVE biscuits and gravy and that gravy recipe jumped out at me right away. LOL! Hugs! Well, any fan of a movie like "Fried Green Tomatoes" should be a fan of my biscuits and gravy! What a fabulous building--I'll just take that please! Now we do have a question about this local farming everyone seems to be talking about lately (have you seen Endless Feast?) --what do people eat in the winter? No, I haven't seen that; I'll have to look into getting it. I saw a show on PBS about farmers in an area of the Northeast with long, harsh winters who were farming all but about two months of the year through one means or another. Also, if you read "Animal, Vegetable, Miracle: A Year of Food Life" (see my Batterie de Cuisine page), you'll see how it works. This blog is a visual beauty! Wonderful job. Thanks so much, Jo! Glad you like it.